Will New Zimbabwean President Appoint Leaner, Inclusive Cabinet? Is Zimbabwe's New Leader Cut From the Same Cloth as Mugabe? Is Zimbabwe's New President Up to the Task? Light at the End of the Tunnel for Zimbabwe? President Emmerson Mnangagwa dissolved cabinet Monday and immediately appointed two allies to, in the interim, hold forte at two of the great offices of state - finance and foreign affairs. 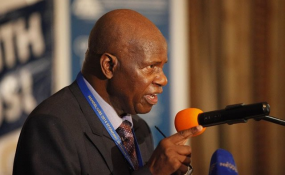 Patrick Chinamasa returns to finance and Simbarashe Mumbengegwi to foreign affairs as the president puts together his new cabinet after assuming office last Friday. The development comes as Zimbabweans eagerly await the new president's cabinet line-up to see whether he will bring into government fresh blood or keep faith with veteran colleagues. Talk has also centred on speculation over whether Mnangagwa would into government members of the opposition to help right the country's battered economy. Chinamasa and Mumbengegwi led the same ministries before they were demoted in a reshuffle by former president Robert Mugabe last month. The reshuffle, which side-lined Mnangagwa's allies leading to his dismissal by Mugabe was part of the events that culminated in Mugabe's resignation last week. A statement by cabinets secretary Misheck Sibanda Monday confirmed the appointments of Chinamasa and Mumbengegwi. "The president ... has dissolved cabinet, and is in the process of putting together a new team of cabinet ministers," said Sibanda. He added that Chinamasa and Mumbengegwi had been appointed acting ministers "to allow for uninterrupted services in critical ministries". In addition the normal Tuesday cabinet gathering would be replaced by a meeting between the new president and the permanent secretaries. Meanwhile, Mnangagwa's cabinet line-up will be keen examined for indications of the direction of travel for the new administration. "The composition of the new government will show a clear path whether we continue with the status quo or the clear break with the past that we need to build a sustainable state. It's a simple choice," former finance minister and opposition leader Tendai Biti told Reuters news agency. "Zimbabwe needs all hands on deck...We cannot continue reproducing these cycles of instability." However, for some analysts a coalition government is pointless for the opposition if, as Mnangagwa indicated, elections will go ahead as scheduled next year. "If I were an opposition politician I would say: what's in it for me? Unless I'm convinced I'm going to lose the election, I won't participate," business studies lecturer Professor Tony Hawkins told Reuters. "He (Mnangagwa) might introduce technocrats from commerce and that will send out a signal of sorts... As far as the international community is concerned legitimacy is important. It's a very delicate situation and he has very little room for manoeuvre."